Hundreds of holidaymakers have been left without their luggage after a failure at Gatwick Airport saw them arrive at their destinations without bags. Over the weekend, a number of bags were not put on flights leaving the North Terminal, because of problems with the system. 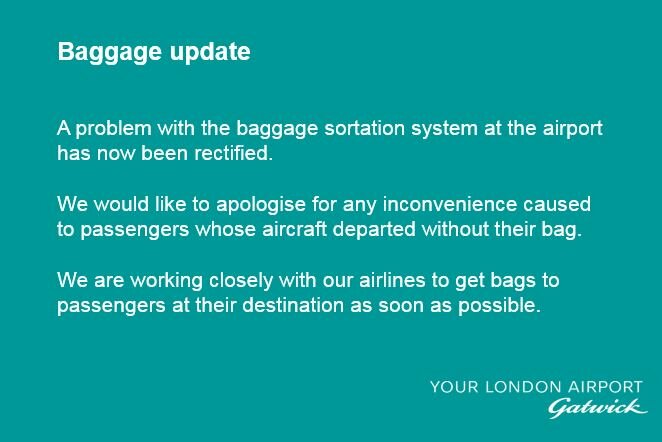 A Gatwick Airport spokesman said: "A small number of bags were not put on departing flights over the weekend due to an issue with the baggage system. The issue has since been rectified. "Gatwick recognises the inconvenience that this issue has caused and would like to apologise to anyone affected. Passengers should contact their airline for the latest information on their missing luggage." Gatwick Airport has advised passengers to use only airport-approved car parking operators when parking before they travel, after a non-approved company failed to return vehicles to over 100 passengers. Run in partnership with the British Parking Association, the scheme was introduced to offer Gatwick passengers more confidence when choosing off-airport parking, and only features suppliers that have adhered to the approval processes of Trading Standards’ Buy with Confidence programme. More information about Gatwick’s Approved Operators Scheme can be found at www.gatwickairport.com/parking/other-parking-options/operator-scheme/. For some people, the bank holiday got off to a nightmare start when problems with the baggage system at Gatwick failed to work. Many people are now on holiday without their luggage. One of those passengers are Lucy Dodd. She gave us an exclusive interview. There's been chaos for thousands of airline passengers at Gatwick when they had to fly out - leaving their luggage behind. Around 3,000 were bags delayed. It was caused by a breakdown in the baggage handling system - which had been recently upgraded. It was repaired by midday - but not before a massive backlog had built up. Passenger Katie described the chaos caused by the baggage problems at Gatwick. 2/2 To ensure that everyone gets away on time some flights are departing without all bags and these will be sent on as soon as possible. Heathrow remains "best option for expansion"